Who do You Call for Snake Removal or Removals in Brisbane? Here in Australia, its common knowledge that people and snakes need to co-exist, but when an unwelcome visitor has entered your personal or commercial property, it is totally normal to want them to exist somewhere else. Instead of putting yourself or anyone else at risk by trying to remove them contact Snake Catcher Brisbane for professional snake removals in Brisbane. In this way, you avoid not only an unwanted snake bite but also unintentional injury to the snake. The Brisbane suburbs are host to a diverse population of venomous and non-venomous snakes including the Eastern Brown Snake, Red-Bellied Black Snake, Yellow-Faced Whip Snake, and many others. Concern is a regular response when encountering an unidentified snake, but a hasty response increases the risk of injury to yourself, family, pets, and the snake itself. However, it may help to understand that you only need to maintain a vigilant watch on the snake and monitor the its movements, as well as removing people and pets from the area. In fact, as a layperson, rather than attempting to capture the snake the best thing you can capture is an excellent photo to show the Brisbane snake removal expert when they arrive. Even if you believe you can correctly identify the snake as non-venomous and remove it yourself, we strongly caution against this strategy. First of all, the vast majority of snakebites occur when an inexperienced person attempts a capture because snakes will defend themselves when they feel threatened. With a non-venomous snake, this is theoretically not as serious, medically significant injuries can occur. Secondly, our Brisbane snake removals are conducted under guidelines and permits issued by the state government with the goal of humane capture and welfare-minded relocation. Why Should You Call Us Specifically for Your Brisbane Snake Removal? In a word – professionalism. This is what we do. Since snake encounters are so common in Brisbane, we know that you’re probably inundated with information when you started looking for snake removal. It may seem hard to decide on the right person or business to call when everyone is going to advertise in a similar fashion. Damage Mitigation Permit – this is the official removal and relocation permit issued by the Department of Environment and Heritage Protection. 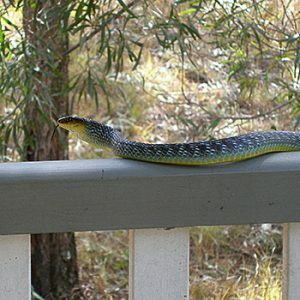 Demonstrated Knowledge of Your Area – not only should the Brisbane snake removal expert be familiar with all of the species that occur in your area – they should also be able to interpret the dynamics of your site to assist with this capture and advise you on how to make your property less attractive to these unwanted guests. 24/7 availability – we know that when you need help, you need it RIGHT NOW. With our vast network of providers, we can promise quick turnaround service no matter the time or day of the week.